If you want to make sure you've got a cold drink ready at the end of your hike, this is your bottle. The vacuum-insulated steel Camelbak Chute™ Vacuum Insulated 20oz Stainless Water Bottle keeps things frosty for up to 24 hours-even longer if you add ice. If you want to make sure you&apos;ve got a cold drink ready at the end of your hike, this is your bottle. 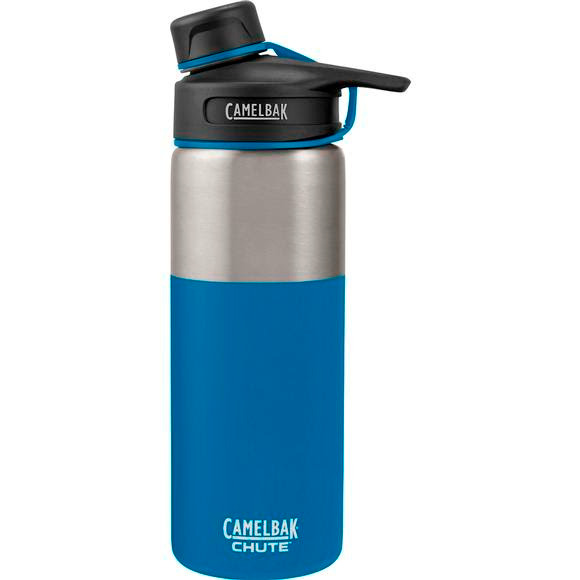 The vacuum-insulated steel Camelbak Chute™ Vacuum Insulated 20oz Stainless Water Bottle keeps things frosty for up to 24 hours-even longer if you add ice. The bottle is designed for chugging, with a high-flow spout and a cap that fits neatly into the handle to stay out of your way when you&apos;re drinking. The double-walled design keeps condensation from collecting on the outside of the bottle, and the powder-coated paint job keeps things colorful while giving you a little extra grip. Camelbak bottles and reservoirs are 100% BPA-Free, keeping you worry-free from the very first sip.